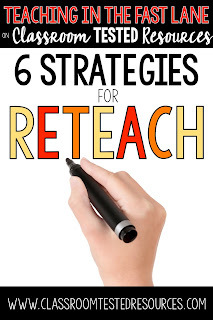 Are you struggling with what to do while reteaching a concept to your students? 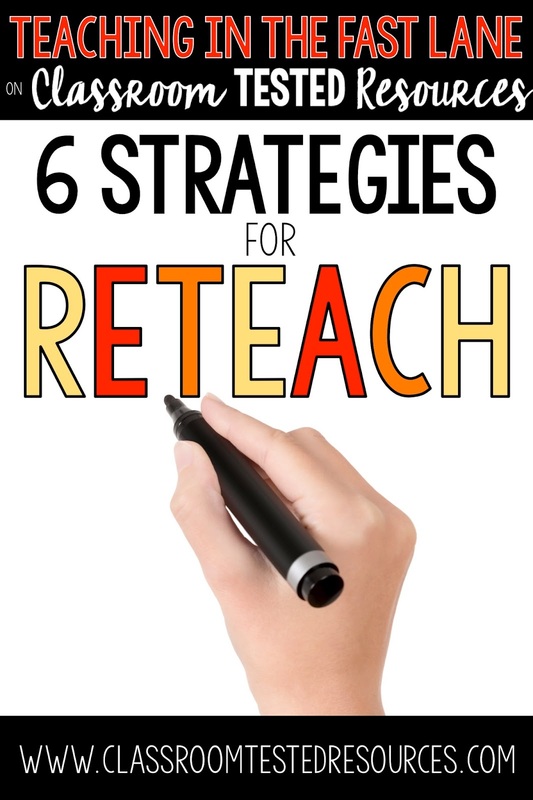 Try these six strategies to beef up your reteach, and make your students feel like rockstars! Sometimes our students have a difficult time understanding a concept because they have no prior knowledge of it. Providing real world examples that they can connect to will increase engagement and allow their brains to build a framework for understanding. One of my favorite ways to build schema is through YouTube videos related to the topic. Our students are deeply interested in video, and if you are able to find a current video that accurately explains a topic they get really into it. From there I encourage students to ask questions to build into our reteach. 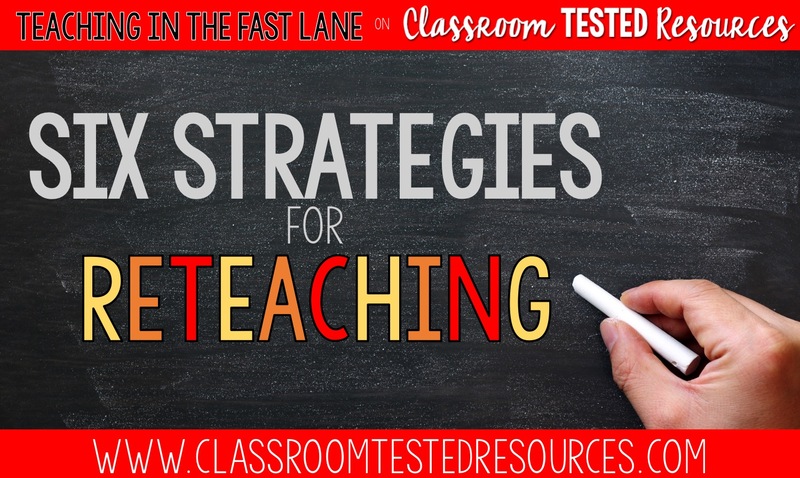 Sometimes students have already heard it from teachers several times and they aren't making the necessary connections to the content. When this happens, give peer coaching a try. In order for peer coaching to be successful it is important to carefully think through who you have in the role of coach. It is tempting to select a student who has shown complete mastery of the content, but the more powerful choice is a student who is right on the cusp of mastery without having achieved it yet. This makes the coaching process powerful for both the coach and the students being coached. I introduce the coach as the "content expert" to the group and give them the floor. In addition I love to record the way the coach introduces and teaches the concept to the group to refer back to. By having a peer coach, students are able to hear the content in a different way, from a different person who they trust. These Big Ten Math Stations are a perfect took to use along with peer coaching. Each unit offers ten different stations built around the same standard to allow students ample practice towards mastery. They are available for second, third, fourth, and fifth grade in bundles or separately. I am slightly cooperative learning obsessed. I love cooperative learning strategies for all areas of the classroom and academic spectrum, but they are especially great for reteaching. While there are far too many strategies to name that would be perfect for reteaching, my absolute favorite has to be sage and scribe. This strategy is amazing for all students, because voicing their thinking really makes them work on their metacognition and work on academic vocabulary. It also allows me, as the teacher, to hear how my students are doing. The power really is in the conversations. Vocabulary really is everything, it can not be underutilized in the classroom. I am a big advocate for pre-teaching vocabulary, but I also understand that it does not always happen. When students struggle with a concept it is imperative that we take the time to ensure that it is not the vocabulary that is getting in the way. There are a myriad of ways to focus on vocabulary, the important part is that you do it. When students are comfortable using academic vocabulary in oral and written language they are able to better grasp concepts as a whole. One of my favorite ways to include vocabulary, and get students writing, is through photo quick writes. I show students a photo as well as give them a word bank of vocabulary terms to use to write everything they know about the concept. Their writing is a great way to flush out what vocabulary they truly know and what needs some more work. Another easy activity to complete with vocabulary is a word sort where students simply take a deck of vocabulary cards, like these word wall cards, and sort them into words they know and words they need help with. Our goal is always to reach learners in as many ways as possible, and one of the easiest ways to reach a new learning style is through visuals. This might mean creating an anchor chart together, making individual mind maps, illustrating vocabulary words, or sketch notes. The sky is truly the limit, and follow the guidance of your students when it comes to visuals. Often it is difficult to apprehend where the break down is when it comes to understanding, so it becomes important to stop and check for understanding as often as humanly possible while reteaching. There are many ways to check for understanding, and you should do what works best for you. I of course love these cooperative learning strategies that are perfect to check for understanding. If you have a goal of using more tech, try one of these simple ways to check for understanding with tech. Whatever you do, just do it early and often.